Rocket Raccoon is a hero in the Marvel universe. He is known for being a member of the modern Guardians of the Galaxy team. He is featured in the film Guardians of the Galaxy, with actor Bradley Cooper supplying his voice. James Gunn has said that Rocket Raccoon's origins are going to be explored in future films. It is not clear if he meant Guardians of the Galaxy III or another film. His comments were made at a Hasbro event called Hascon. At the same event Gunn said he was working on films "around" Guardians of the Galaxy III mentioning other cosmic films that included Nova and Adam Warlock. Its possible that Rocket's origins could be made into its own film or simply be part of one of these other Cosmic Marvel films. Rocket is from a planet called Half World. Half World is a planet for the mentally ill and is initially run by robots. The robots eventually become sentient and decide they are bored with taking care of the loonies. The robots don't want to be completely irresponsible though so they genetically alter the animals they have with them into caretakers. 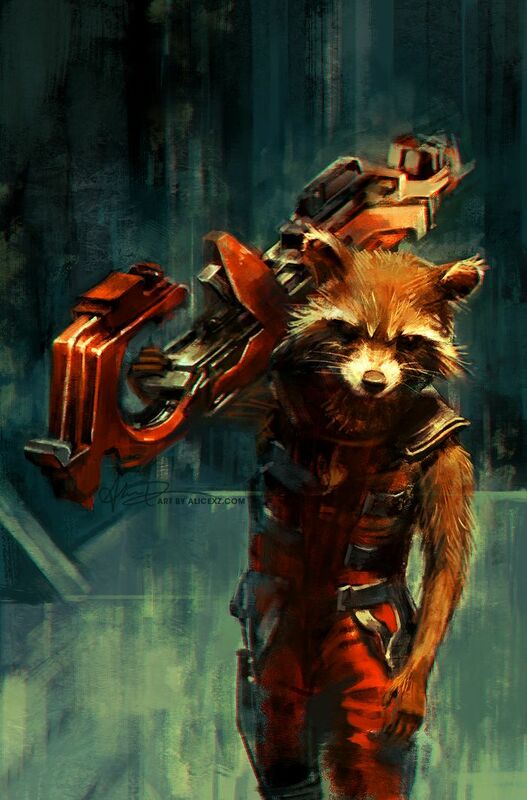 Rocket is designed from a Raccoon to be the planet's law officer. The robots strip mine the planet of its resources and take off in a giant ship leaving only half of the world left. The world has an economic / political structure built around supplying toys to loonies. He has a girl friend and a best friend on Halfworld. Lyla an Otter is his girl friend and Walrun a Walrus is his best friend. There is also a main adversary in Blackjack O'hare a rabbit mercenary who battles both with and against Rocket depending on his goals. It is not clear if these character really existed or will be implanted memories in the movie and 616 version of the character. The halfworld stories are a lot of fun but their style is whimisical and surrealistic and contrast with darker, angst ridden Rocket that is the current Guardians of the Galaxy. Upon leaving the planet Rocket Raccoon is captured by the Kree (One group of Marvel aliens) and is freed by Star Lord where they form the Guardians of Galaxy the 2008 version. He reappeared in the Marvel Universe in Annihilation / Thanos Imperative storylines and after being forgotten for decades is now a very popular character. Rocket is an expert fighter, pilot, and marksman. He is a great strategist and is able to understand his opponents motivations and use them against them. He also has the feral senses of a raccoon, increased smell, and hearing. He does not possess super durability or strength. Rocket tends to be outfitted with space ships and guns - lots and lots of guns. While this does not sound super impressive his intelligence has allowed him to stand up to the biggest and baddest threats in the Marvel Universe. Rocket Raccoon appears in the Guardians of the Galaxy films and is voiced actor Bradley Cooper. An actor playing Rocket Raccoon for other actors to act with has been played by Sean Gunn (brother of James Gunn) who also plays the Ravager Kraglin. Rocket and Groot are bounty hunters searching for prey on the planet of Xandar when they see Starlord who has had a large bounty placed on his head by Yondu. Groot and Rocket battle Starlord but their capture of Starlord is interupted by Gamora who is attempting to escape with the Power Infinity Stone. As the group battles they are all caught by the Nova Corps and brought to the intergaltic jail the Klynn. At the Klynn the group meets Drax the Destroyers who initially wants to kill Gamora due to her past involvement with Thanos who killed his family. He is convinced that Gamora is not the one he wants and that if he works with them to escape he can get his hands on Ronan and Thanos. Rocket masterminds a daring escape from the Klynn that utilizes all the members skills of their new rag tag group. The group goes to sell the gem to the Collector where Gamora hopes it can be safe. This ends in a fiasco where the group decides the only safe place for the stone is the Nova Corps however the stone is confiscated by Ronan who decides he wants to use it to destroy the planet of Xandar and Nova Corps forever. The newly minted Guardians of the Galaxy join with Ravager forces to attack Ronan's forces. When Ronan tries to place the Power Stone on the ground an act that would destroy the world it is held up by Star Lord and the rest of the Guardians join hands to control the stones energies and save the planet. Rocket's friend Groot sacrficied himself in the battle with Ronan but Rocket manages to regrow Groot from a piece of Groot's former body. Rocket begins to raise the sapling Groot in the end of the film. Rocket continues to act as Groot surrogate father as the group goes to battle a large Abelisk space beast as a job for a group called the Sovriegn. While successful in their task Rocket steals special batteries from Soveriegn that infurtiates them. The Soveriegn launch armada of drones after the Guardians to punish them for the theft. The group is saved by a mysterious man named Ego who then claims be to Peter Quill's father. Quill, Gamora and Drax decide to venture Ego's homeplanet while Rocket, and Groot stay behind with the captive Nebula to repair their ship. The ship is found by the Ravagers whose strike is met by inguitive and deadly traps of Rocket. However, in the end Rocket is forced to surrender when met by the deadly arrow of Yondu. The Ravagers don't like Yondu's plan of releasing Rocket however and instead mutiny. Rocket, Groot and Yondu find themselves as captives in the Ravager ship as the mutiny led by Nebula and Taserface kill off members of the group that are loyal to Yondu. Yondu, Rocket, and Groot escape with the help of the last loyal Ravager Kraglin who gives Yondu a prototype Finn that can be used to control his deadly arrow. The group then proceeds to the planet Ego where they find the rest of their Guardians in a battle with Ego. They manage to plant a bomb in Ego's core and escape. However, in order to save Star Lord, Yondu is forced to enter space without a suit. He sacrifices himself to save Peter. Rocket Raccoon is bizarre, creative, ironic, absurd, sad, and funny all these things bundled into one cute fury animal who sports giant guns, intelligence, and lots of humor. If you do not love him after you finish watching the movie, Marvel has really messed up. Rocket Raccoon is not one of the initial members of the Guardians of the Galaxy. He is added into the 2008 incarnation (In my opinion the best incarnation) of the group. This is also called the "Modern" Guardians of Galaxy as their stories take place in the present Marvel universe while their predecessors stories were in the 31st century. His publication origins go back to the early 1980s. His first appearance is Incredible Hulk #271. There is some disagreement on this. If you are curious see The Great Rocket Raccoon 1st Appearance Controversy. 2014, Agents of Shield, Awesome, bio, Cosplay, Drax, Gramora, Groot, Guardians of the Galaxy, Halfworld, Marvel, movie, Raccoon, Racon, Rocket, Rocket Raccoon, Who, Who is Rocket Raccoon?